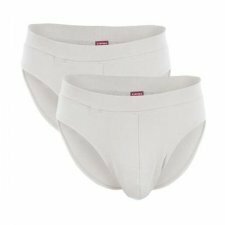 Classic boxer shorts in a convenient twin-pack and without side seams for high wearing comfort. Pleasantly soft men's shorts with button at the fly and stitched down elastic waistband. Colours: 1 black with grey stripes and 1 grey with black stripes or 1 blue with teal stripes and 1 teal with blue stripes. Classic men pants made from 95% organic cotton and 5% elastane. Kind to the skin, because made of organic cotton, perfect fit. Pure underwear for men: slip made of 100% organic cotton in pleasant fine rib quality. 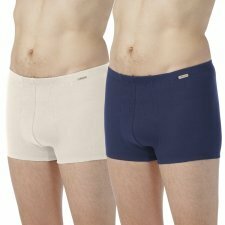 Pure underwear for men: slip with a fly made of 100% organic cotton, in pleasant fine rib quality. Without seams at the sides. Colours: natural white or dark navy. Twin pack man slip from 100% organic cotton soft on your skin and suitable for people with sensitive and allergic skin. 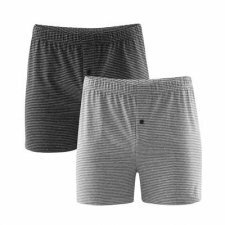 Men's boxer soft and comfortable, made of 100% undyed ribbed organic cotton. Soft cotton jersey material: 95% organic cotton and 5% spandex. Men's brief, mid rise, made of 100% undyed ribbed organic cotton. Mid rise pattern. 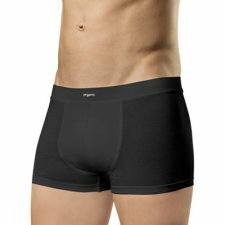 Men's bamboo briefs, ribbed stretch fabric. Made of 95% bamboo and 5% elastane. The bamboo fabric is naturally transpiring and anti-allergic. Warm men's leggings made of 100% organic wool. Fine rib. Available in sapphire or turquoise. Warm men's leggings made of 70% organic wool and 30% silk. Fine rib. Available in light grey melange.